Two Palestinian young men were wounded with live bullets during Israeli violent quelling of a peaceful demonstration at the northern entrance to Bethlehem city on Sunday night. The PIC reporter said that Israeli occupation forces (IOF) fired live ammunition at the young men along with teargas and sound bombs. He said that one of the young men was hit with a bullet in his knee while the other was hit in his foot, adding that dozens were treated for gas suffocation. Medical sources said that IOF soldiers blocked medical teams from reaching the wounded youths and left them to bleed for a while before allowing their evacuation. 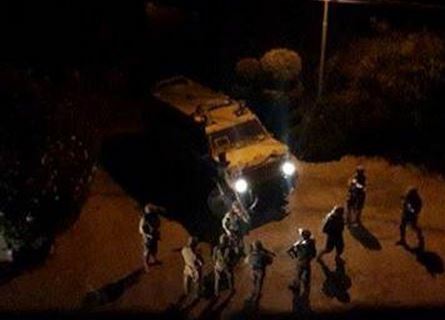 In another incident, IOF soldiers raided Walaja village, north of Bethlehem, also on Sunday night and clashed with young men protesting the raid. The soldiers fired teargas and sound bombs on houses during the incursion. A gang of Israeli extremist settlers burned down dozens of Palestinian olive trees in Hawara town, south of Nablus, and in Barta’a, in Jenin. Eye-witnesses told a PIC correspondent that hordes of Yitzhar settlers set fire to Palestinian olive trees in al-Laf area, near Hawara town. Several trees were reduced to ashes as a result of the fires that spread out quickly, the witnesses added. In a related event, the Israeli occupation troops set fire to Palestinian agricultural lands in eastern Barta’a, in Jenin, leading to severe material damage. 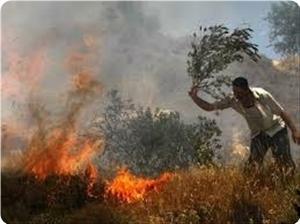 Violent clashes broke out between the landowners and the IOF soldiers in the process. 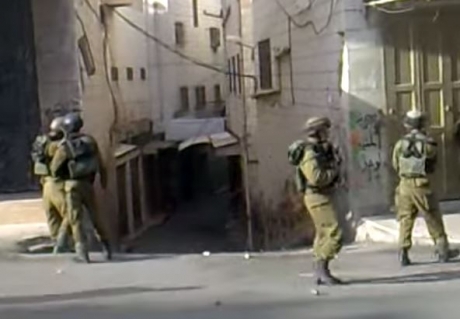 The IOF soldiers have been cordoning off the industrial and commercial zone in the village. Dozens of Palestinian civilians were rushed to hospital as they inhaled tear gas fired by the IOF throughout the clashes. 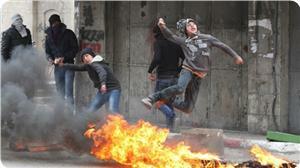 Seven Palestinians were injured late Sunday in clashes near Ramallah, locals said. Clashes broke out in the village of Sinjil, with youths throwing stones and Molotov cocktails at soldiers, who responded with tear gas and rubber-coated steel bullets. Witnesses said Israeli soldiers were deliberately firing tear gas canisters at residential homes. Three youths were also detained after being assaulted by Israeli forces. Several Israeli military jeeps invaded, on Monday morning, the Sammoua’ town, south of the southern West Bank city of Hebron, seriously shot a young Palestinian man, and left him bleeding to death. Medical sources said the soldiers fired rounds of live ammunition at Monir Ahmad Hamdan al-Badarin, 21, causing serious injuries, and left him bleeding onto the ground until her uttered his last breath. Local medics arrived at the scene before the young man died of his wounds, but Israeli soldiers prevented them from reaching him, until he died nearly 40 minutes later. Coordinator of the Popular Committee against the Wall and Settlements, Rateb Jabour, stated that clashes took place with the invading soldiers, and that the army fired gas bombs, rubber-coated metal bullets, and rounds of live ammunition. Several Palestinians have been injured by rubber-coated metal bullets, and scores of residents received treatment for the effects of tear gas inhalation. Israeli soldiers invaded, on Monday at dawn, different Palestinian communities in the occupied West Bank, and kidnapped 11 legislators, and several other Palestinians. The Ahrar Center for Detainees’ Studies and Human Rights has reported that the soldiers kidnapped Professor Ibrahim Abdul-Sattar Qassem, a prominent intellectual and a professor at the Najah University in Nablus, in the northern part of the occupied West Bank. 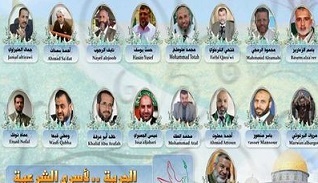 Ahrar added the soldiers also kidnapped former Finance Minister, Legislator Dr. Omar Abdul-Razeq, from Salfit in central West Bank, and Legislators Daoud Abu Sier and Riyadh al-’Omla Qablan, in the northern West Bank district of Nablus. In Jenin and Tulkarem Districts, in northern part of occupied West Bank, soldiers kidnapped legislators Khaled Sa’id and Ibrahim Dahbour (Jenin), in addition to legislator Riyadh Raddad and Fathi al-Qar’awy in Tulkarem. Legislator Fadel Hamdan was also kidnapped in the central West Bank district of Ramallah. In Hebron, in southern part of the West Bank, soldiers kidnapped legislators Mohammad Abu Jheisha, Mohammad At-Till, and Nayef Rajoub. 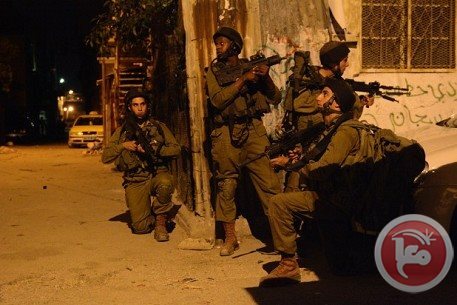 Soldiers also kidnapped several Palestinians in Hebron, and took them to a nearby military base. Some of the kidnapped in Hebron have been identified as Arafat al-Qawasmi, Ja’far al-Qawasmi, Waheeb Walid an-Natsha, Bashar Hassouna, Ammar Sharif, Anwar Abdul-Rahim al-Joulani, 25, and Adnan az-Zaro, 34. Soldiers detonated main doors of many homes in Hebron, before invading and searching them, causing excessive property damage. In Bethlehem, soldiers kidnapped Mahmoud Kamel Sabah, Mohannad Nasser Sabah from Teqoua’ village and Mahmoud Hussein Zawahra from al-Ma’sara village. Dozens of Palestinians have been treated for the effects of tear gas inhalation in Hebron, while many were shot by live rounds and rubber-coated metal bullets, in clashes in Hebron, Bethlehem, Tulkarem, Salfit and Ramallah. Palestinian medical sources in Hebron, in the southern part of the occupied West Bank, has reported that two Palestinians have been shot and injured by Israeli military fire, at the main entrance of Beit Ummar town, north of Hebron. Coordinator of the Popular Committee against the Wall and Settlement in Beit Ummar, Mohammad Awad, said Mahmoud Yasser Breghieth, 21, was shot by a live round just below one of his knees, and Mahmoud Nasser al-Hittawi, 20, was shot in his leg. The two wounded Palestinians were moved to the Hebron Governmental Hospital, in Hebron city. Local sources said clashes took place in Aseeda area, at the main entrance of the town, after dozens of soldiers invade it. In related news, Hasan Breijiyya, coordinator of the Popular Committee against the Wall and Settlements in al-Ma’sara village, south of Bethlehem, said several Israeli military jeeps invaded the village, and kidnapped his brother Mohammad, 37, after breaking into his home, and ransacking it. Breijiyya said the also soldiers assaulted him, his brother and their mother, inflicting various cuts and bruises. Violent clashes broke out at dawn Sunday between Palestinian young men and Israeli troops in different towns of Al-Khalil. Eyewitnesses told the Palestinian information center (PIC) that seven young men suffered rubber bullet injuries, one of them in his head, and many others suffered from tear gas inhalation during clashes in Asida area in Beit Ummar town. Several young men were also injured, three of them with live bullets, during clashes in the area of Halhoul Bridge and at the entrance of Bani Naim town. Similar confrontations also broke out at dawn in Dura town, south of Al-Khalil, while security forces from the Palestinian Authority intercepted and attacked a group of young men as they were marching to Bab Azzawiya area in Al-Khalil to start clashes with IOF soldiers. Ze'ev junction, north of Yatta town, also saw violent events between young men and IOF soldiers. 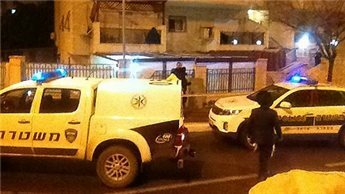 Two Israeli extremists attempted to stab a Palestinian woman and her two children as they passed through a Jewish neighborhood in the Old City of Jerusalem late Saturday. A Ma’an reporter said that the two Israelis attempted to stab Umm Ziyad Abu Hadwan, her daughter Fidaa, 10, and her son Ahmad, 8. Her husband said that the Israelis verbally abused her before one of them took out a knife. They started screaming and managed to flee to a shop in the chain gate area. The Israelis attempted to follow them but were stopped by people at the gate. Violent clashes broke out on Friday night in Ramallah and other areas of Jerusalem between young men, protesting Israel's war crimes in Gaza, and Israeli soldiers. 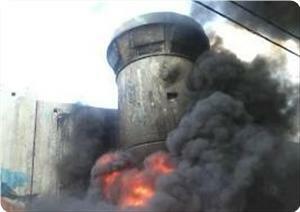 Eyewitnesses said that young men attacked a military watchtower at Qalandiya checkpoint, south of Ramallah, with Molotov cocktails and fireworks, causing material damage to the place. 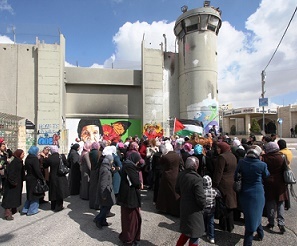 Afterwards, the Israeli occupation forces intensified their presence at Qalandiya checkpoint and embarked on firing bullets, and tear gas and stun grenades at the pro-Gaza protestors. Scores of young men suffered tear gas and bullet injuries during the confrontations. In Jerusalem, similar clashes took place in Anata town to the east between young men and Israeli troops. According to local sources, a troop carrier sustained external damage when it was directly hit with Molotov cocktails during the violent events in the town. The sources affirmed that the confrontations were so violent because of the use of incendiary bombs by the young protestors. In the Jerusalemite town of Abu Dis, dozens of young men went on a protest march on Friday evening in solidarity with Gaza and clashed with Israeli troops near a military post in the town. Several young men suffered rubber bullet and tear gas injuries during the events. Similar clashes reportedly happened at Shuafat checkpoint and Al-Sawwanna neighborhood to the east of the Old City of Jerusalem. Nine young Palestinians were injured during clashes with Israeli soldiers near Rachel's Tomb, during the night on Thursday. In Jerusalem, restrictions were placed again on worshippers at al-Aqsa mosque. Tariq Jawarish, age 22, was hit in the foot with live fire, Ma'an has reported, and nine others suffered the effects of teargas inhalation as protesters marched against Israel's ongoing invasion of the Gaza Strip. Two youth were hit with rubber-coated metal bullets, in addition. 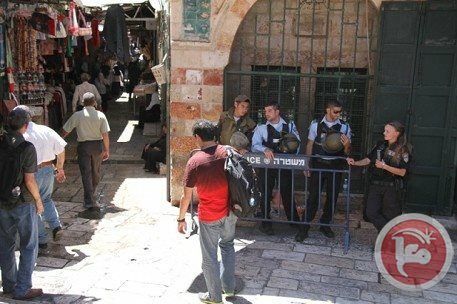 Furthermore, in Jerusalem, forces imposed restrictions on Palestinian worshipers entering al-Aqsa Mosque, on Friday. 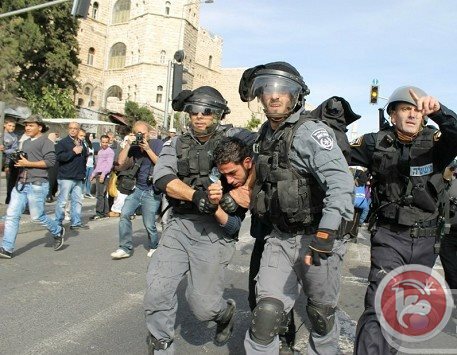 "Israeli forces turned Jerusalem into a military base and imposed restrictions on worshipers entering the al-Aqsa compound for the second Friday in a row," said al-Aqsa foundation via a statement. Men younger than 50 were barred from entering the mosque for Friday prayers, and Israeli police set up barricades in both the Old City and around Damascus Gate, according to Ma'an. Five Palestinians were injured with live bullets in clashes with Israeli forces in Kafr Qaddum village northeast of Qalqilya. Witnesses said that Israeli soldiers using a silent rifle fired at Palestinian protesters injuring five of them. Medical sources said the five were in stable condition. Hundreds of residents participated in a weekly protest in the village calling for the re-opening of the village’s main street which was closed in 2000. Twenty Palestinians were injured in clashes with Israeli forces in al-Issawiya village in East Jerusalem on Friday, officials said. Village monitoring committee member Mohammad Abu al-Homs said clashes broke out after Palestinians marched in support of the people in Gaza. Israeli forces fired stun grenades and rubber-coated steel bullets at them injuring 20. Abu al-Homs added that Israeli forces also sprayed skunk water randomly at people and homes. Nine youths were injured during clashes with Israeli soldiers near Rachel's Tomb overnight Thursday. 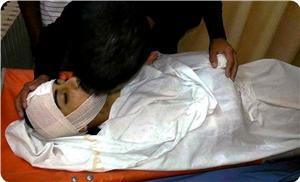 Tariq Jawarish, 22, was hit in the foot with live fire and nine Palestinians suffered tear gas inhalation. Two youths were hit with rubber-coated steel bullets. Israeli forces fired tear gas canisters, rubber-coated steel bullets, and skunk water at a march protesting Israel's ongoing assault on the Gaza Strip, which has killed over 90 Palestinians. 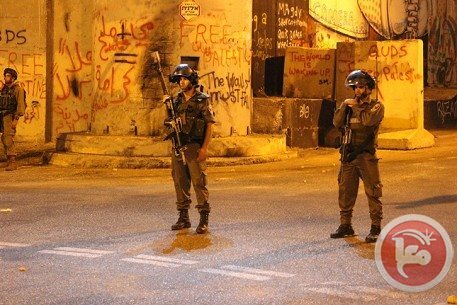 A wave of violent clashes broke out Thursday evening and Friday morning between the Israeli occupation forces (IOF) and a group of Palestinian youths in different areas of Bethlehem and al-Khalil. A PIC correspondent at the scene said dozens of Palestinian youths were treated for breathing problems and other suffered injuries as the IOF targeted a rally staged in protest at the Israeli aggression against Gaza, using live ammunition, tear gas, and rubber bullets. Tarek Jawarish sustained a bullet injury in his feet while Ahmad Awda was hit with a tear gas grenade in his face. In another incident, other civilians suffered from tear gas inhalation during confrontations with Israeli troops in Housan village, west of Bethlehem. 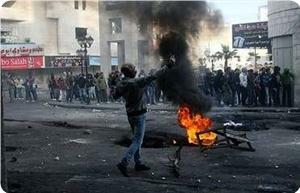 Other clashes erupted on Friday in different areas of al-Khalil, including Kharsa, Tabaka, Ahnina, and Bab al-Zawia. Heavy firing of tear gas canisters and stun bombs by the IOF took place. Injuries have been reported in the clashes that happened in Bab al-Zawia, where dozens of Israeli occupation patrols have been deployed in an attempt to launch a mass-arrest campaign against Palestinian youths. Local sources in al-Khalil reported confrontations with the IOF in Bani Na’im to the east of al-Khalil for the second day running. Dozens of Palestinian young men suffered breathing problems due to IOF heavy firing of tear gas. Palestinian citizen Jalal Matwer, from Bani Na’im, was rounded up by Israeli special forces in the events. The situation has been no less tense in Beit Ummar and around al-Aroub refugee camp, north of al-Khalil, after a drove of Israeli troops aboard armored jeeps stormed the area and deployed themselves on rooftops of homes. Palestinian citizen Muhammad Ayash was rushed to a hospital after he was shot with an IOF rubber bullet in his head, eyewitnesses in Beit Ummar told the PIC. 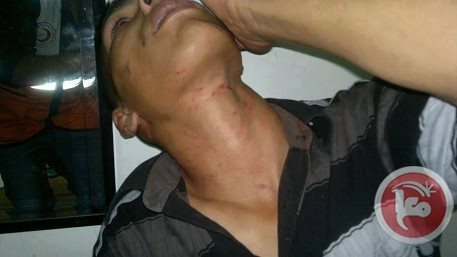 Israeli soldiers attacked a Palestinian man from el-Arrub refugee camp in Hebron late Wednesday, locals said. Witnesses said Islam Abu Rayya, 22, was walking on the main road between Beit Ummar and el-Arrub after finishing a night shift at a stone factory, when a group of Israeli soldiers patrolling the road assaulted him. Abu Rayya sustained bruising to his head, eyes, and ears and was treated by Red Crescent medics. 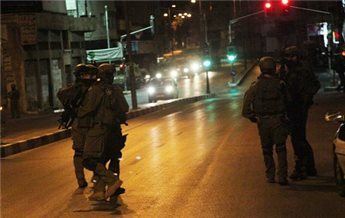 Meanwhile, Israeli forces detained two Palestinians in the Bethlehem village of Tuqu. Izz Ad-Din Khalid Sabbah, 20, and Jaafar Yousif Sabbah, 19, were identified as those detained. Three young Palestinian men were hit by rubber-coated bullets during clashes with Israeli soldiers late Tuesday near Qalandiya checkpoint between Ramallah and Jerusalem. Witnesses told Ma’an that Israeli soldiers fired tear-gas canisters and rubber-coated bullets at Palestinian stone-throwers. 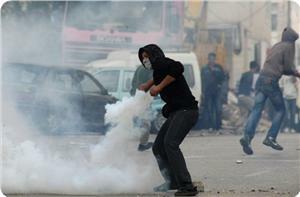 Three were hit by rubber-coated bullets, and dozens suffered from suffocation as a result of inhaling tear gas. Scores of Palestinian citizens sustained wounds Tuesday and at dawn Wednesday after having been targeted by a barrage of bullets and tear gas randomly shot by the Israeli occupation forces (IOF) throughout the round of clashes that have burst out across al-Khalil and Bethlehem. According to local sources in al-Khalil, Amir al-Rajabi was injured by live ammunition after the IOF opened fire on him near the Ibrahimi Mosque. The Israeli soldiers dragged the injured civilian to an unknown destination after having heavily beaten him up. A spate of violent clashes broke out in the nearby Bab al-Zawia, where the Israeli occupation troops targeted Palestinian civilians with tear gas canisters and rubber bullets. Scores of Palestinian youths have been treated for breathing problems as they inhaled tear gas fired by the IOF all along the attack. Other injuries have been reported in the ongoing clashes waged by the IOF in Kharsa village and al-Tabaka crossroad, near Dura. In an earlier incident Tuesday, dozens of Palestinian citizens suffered breathing problems in Beit Ummar clashes, north of al-Khalil. Local sources told the PIC news reporter that large numbers of Israeli patrols cordoned off the cemetery between al-Khalil and Bethlehem and attacked scores of citizens who gathered at the funeral of a Beit Ummar native. The assault brought about clashes between the heavily-armed Israeli troops and a group of Palestinian youths, who could only respond by hurling stones. The incident coincided with a series of brutal confrontations triggered by the IOF Tuesday evening following an abrupt incursion into Bethlehem. Dozens of Palestinian citizens were injured throughout. The PIC correspondent reported that 19-year-old youth Wissam al-Khalil kept bleeding for a long while after he sustained a severe thigh wound incurred in IOF random shooting of live ammunition all the way through the clashes that burst out around Bilal Bin Rabah mosque, north of Bethlehem. The PIC news reporter further kept record of rubber bullet and gas wounds during the clashes that have spread across the Aida and Azza refugee camps. Meanwhile, a Palestinian citizen was rounded up by the IOF as he tried to voice his disapproval over an arbitrary assault carried out by extremist Israeli settler gangs into Kisan village, to the east of Bethlehem, the PIC correspondent added. Some 11 Palestinians were injured in clashes with Israeli troops near Ramallah early Wednesday, locals said. Witnesses told Ma'an dozens of Palestinians set fire to an Israeli watchtower near the entrance to the Beit El settlement before Israeli forces shot at them with live fire and rubber-coated bullets. A young man was hit by a rubber-coated bullet in the eye, severely injuring him, locals said. Three others were shot by live bullets in their lower extremities and six were hit by rubber-coated bullets in the back and stomach. Additionally, witnesses said journalists and ambulance workers were hit by rubber-coated bullets and suffered from excessive tear gas inhalation. Ambulances took the 11 injured to the Palestine Medical Complex in Ramallah, where medics said one of them was in serious condition. The clashes started when Palestinians set fire to bushes and trees near Beit El, torched tires near offices of the Israeli Civil Administration, and hurled stones at the buildings. Palestinians had earlier gathered in the area for a protest march in solidarity with the Gaza Strip as Israel continued with heavy airstrikes that killed at least 24 people Tuesday. Earlier, Palestinian youths clashed with Israeli forces in Bethlehem, with witnesses saying three Palestinians were injured by live bullets. 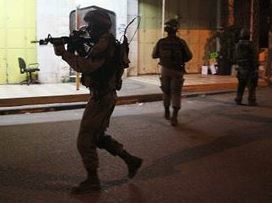 Several Palestinians were injured in clashes with Israeli forces who raided Safa village west of Ramallah on Tuesday. 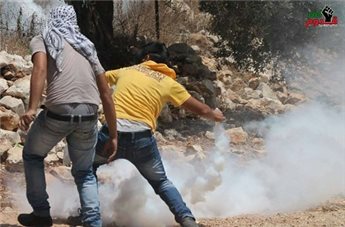 Young men from the village threw stones at a military camp near the village, and Israeli forces responded by shooting at them and firing tear gas before chasing them into the village. They attacked the camp in response to the Israeli offensive on Gaza. Israeli forces raided several houses and climbed onto their rooftops. Palestinian medical sources have reported that dozens of soldiers invaded, late on Monday at night and Tuesday at dawn, different areas in the southern West Bank city of Hebron, leading to clashes with local residents. The Hebron district has been subject to ongoing invasions and assaults, especially after fanatic Israeli settlers kidnapped, and burnt to death, a Palestinian child in Jerusalem last week. Local sources in Hebron said dozens of residents suffered the effects of tear gas inhalation in Bab az-Zaweya area, in Hebron, in addition to Beit Ummar, al-‘Arroub refugee camp, al-Fawwar refugee camp, Kharsa area south of Doura town, and many nearby Palestinian communities. Medical sources in the al-’Arroub refugee camp said a young man was shot by a gas bomb in the abdomen, and suffered a moderate injury, while many Palestinians received treatment for the effects of tear gas inhalation. A young Palestinian man from Kharsa area was moved to a local hospital, suffering a moderate injury, after being shot by a rubber-coated metal bullet in his face. Clashes also took place in Aseeda area, in Beit Ummar town, after scores of soldiers invaded it, and fired rounds of live ammunition, rubber-coated metal bullets, gas bombs and concussion grenades. Local youths responded by throwing stones, empty bottles and some Molotov cocktails at the invading soldiers. The army reported no injuries among the soldiers. Palestinian medical sources have reported that dozens of Palestinians, including children, have been treated for the effects of tear gas inhalation, after Israeli soldiers fired gas bombs at their homes in Ras Karkar area, in Ramallah. Medics and rescue teams rushed to the scene, removed the families from their homes, and provided them with the needed medical treatment. Many children are among the wounded. The soldiers invaded several Palestinian communities in the Ramallah district, stormed and searched Palestinian homes, causing property damage. 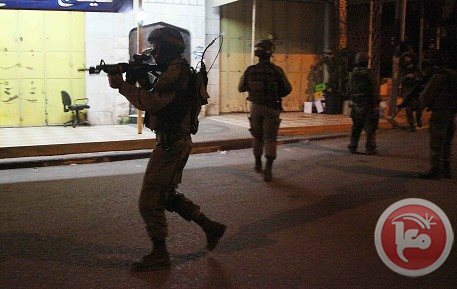 In related news, dozens of soldiers invaded Um ar-Reehan village, near Ya’bad south of the northern West Bank city of Jenin, stormed and violently searched several homes and stores. Palestinian medical sources have reported, on Monday evening, that several Palestinians suffered the effects of tear gas inhalation, near the Bilal Bin Rabah Mosque, north of the West Bank city of Bethlehem. The sources said soldiers, stationed near the Rachel Tomb area, including the nearby concrete military tower of the Annexation Wall, fired dozens of gas bombs at Palestinian protesters. All of the wounded received treatment by local medics. Clashes also took place in the Um Rokba area, south of the al-Khader town, south of Bethlehem, after dozens of soldiers invaded it. Several Palestinians have been treated for the effects of tear gas inhalation; soldiers also searched several homes. Palestinian medical sources have reported that dozens of Palestinians suffered the effects of tear gas inhalation, during clashes with Israeli soldiers invading Hebron city, the al-Fawwar refugee camp, and nearby communities. Eyewitnesses said dozens of soldiers invaded the Bab az-Zaweya area, in the center of Hebron city, and clashed with dozens of local youth who hurled stones at them. Similar clashes took place at the main entrance of the al-Fawwar refugee camp, south of the city. Medical sources said that dozens suffered the effects of tear gas inhalation, while many fainted. One Palestinian was shot in the face by a rubber-coated metal bullet fired by Israeli soldiers invading Kharsa village, south of Hebron, and was moved to a local hospital, while scores of Palestinians suffered the effects of tear gas inhalation. Rateb Jabour, Coordinator of the Popular Committee Against the Wall, stated dozens of soldiers also invaded Zeef area in Yatta town, fired rounds of live ammunition and rubber-coated metal bullets. 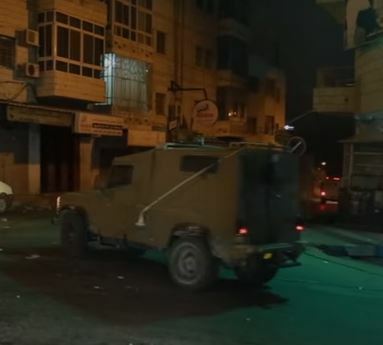 Coordinator of the Popular Committee Against Settlements in Beit Ummar town, Mohammad Awad, said clashes took place in the center of the town, after several armored Israeli military vehicles invaded it, and that dozens of Palestinians received treatment for the effects of tear gas inhalation. In occupied Jerusalem, Israeli soldiers kidnapped four Palestinian children, on Monday at night, in a number of areas including Sur Baher, Bab as-Sahera (Herod's Gate), and close to the Rockefeller Museum. Three children have also been kidnapped in Beit Safafa town, south of occupied Jerusalem. 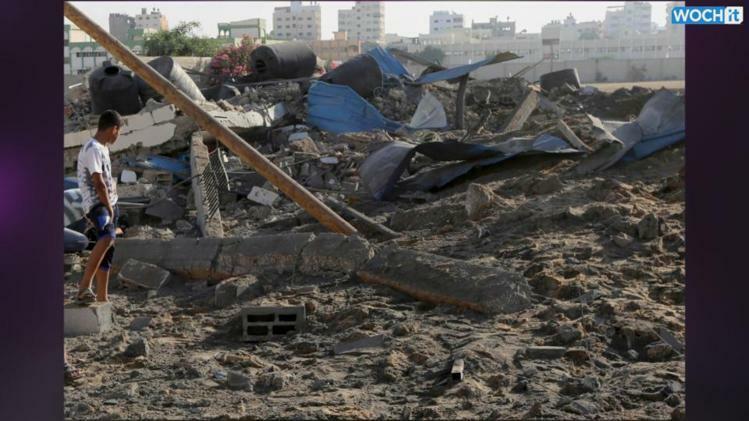 After Israeli airstrikes Monday morning killed nine Palestinians in Gaza, the Israeli military stepped up the airstrikes on Gaza Tuesday morning, dropping more than 50 bombs on the besieged coastal Strip. Israeli officials announced that the airstrikes were just the first of many, in an operation they are calling “Protective Edge”. The Israeli military has amassed a number of troops on the border. In the air strikes in the early hours of Tuesday morning, the Israeli Airforce bombed the homes of four Hamas leaders in Gaza. The barrage of bombs on Gaza came just after U.S. President Barack Obama urged ‘restraint by both sides’. At least seventeen Palestinians were wounded in Tuesday’s attacks. Israeli officials claimed that around seventy homemade shells were fired from the Gaza Strip toward southern Israel. These are crude shells that are little more than tubes with dynamite placed inside, which are fired blindly, without any possibility of aiming them. No injuries or damage were reported from the shells. According to the Israeli daily Yediot Ahranoth, an unnamed Israeli official told the paper, "We are preparing for a long operation. Tonight the [army] attacked 50 targets in Gaza, three from the sea and the rest from the air." The attacks on both nights came in the early morning hours when Palestinian Muslims in Gaza were waking for early breakfast before dawn, since this is the month of Ramadan in which Muslims around the world refrain from eating or drinking between sunrise and sunset. The month of Ramadan is usually a meditative and joyous period, in which Palestinians stay out in the streets late at night to greet family and friends. But the last week of Israeli settler and military violence has pushed many Palestinians to remain indoors, particularly at night. The unnamed Israeli official that spoke to Yedioth Ahranoth claimed that the Israeli military used a tactic of dropping a small mortar on the roof of a home to “warn” the residents that it will be bombed, and then dropping a full-scale bomb a few minutes later. In at least one instance, the Israeli official claimed that the military called the cell phone of the family they were targeting and told them to evacuate, bombing their home a few minutes after the phone call. In the last major Israeli military operation in Gaza, Operation Cast Lead at the end of 2010, the Israeli military killed over 1400 people in about 3 weeks, an estimated 80% of whom were civilians. 14 Israelis were killed in the same time period, 9 of whom were soldiers.